Oxford International Intellectual Property Rights Moot Court Competition one of the prestigious mooting competition among all national and international moots. 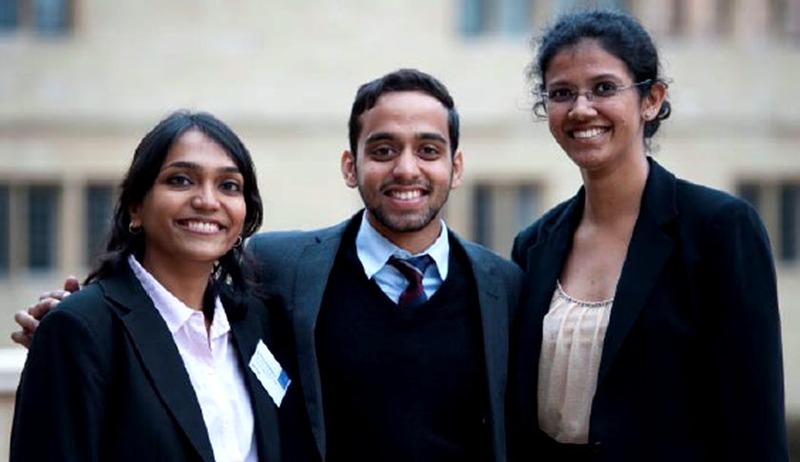 13th Oxford International Intellectual Property Rights Moot Court Competition, 2015(19th to 21st March), held at Pembroke College, Oxford University. The focus of the 2015 hypothetical is on breach of confidence and patent infringement, and is set in the agricultural biotechnology sector. NLSIU team comprising of Ashwini Vaidialingam, Deekshitha Ganesan and Nimoy Kher emerged victorious at the moot. The team faced Monash University, Australia in the Grand Finals. The judges at the Grand Final were: Lord Justice Kitchin and Lord Justice Floyd of the Court of Appeals, and Sir Colin Birss of the England and Wales High Court. Team: We were really delighted. We had worked very hard for the moot, and we were really happy that our efforts paid off. LiveLaw: What was your motivation to do this moot? Why did you decide to do this moot? Team: We had heard a lot about the quality of the moot from our seniors who had participated. All three of us were interested in the area of law, and this moot seemed like a good opportunity to gain more exposure to it. LiveLaw: What difference did you find in as compared toOxford International Intellectual Property Rights Moot to other National and international Moot Court Competitions? Team: One difference between this moot and others is that they try to ensure a balance between the competition and the larger academic pursuit that mooting serves. For instance, they organized a social event called the Conversazione where teams had the opportunity to interact with judges, and ask questions relating to the moot, IP law generally, and the practice of IP law in the UK. This was a very pleasant way to break the ice between participants and judges, and it offered interesting insights into IP law and its practice. LiveLaw: What is the most important thing you learnt while preparing and competing this competing this moot? Team: We learnt a lot from working with each other – maintaining a strong work ethic, managing time well, improving communication skills etc. And all of this while also having fun! LiveLaw: What was the toughest part while preparing for the moot? Team: Preparing for the oral rounds was quite hard. We had heard a lot about the quality of teams at the moot and we had to work hard to adapt our speaking styles to suit the competition. Team: No, we were very enthusiastic and focused throughout. Team: Thank you for the compliment. We had worked with each other previously and had got along really well. We thought we would be able to work together well for the Oxford IP moot given common interests. LiveLaw: What pattern did you guys adopt for your preparation? How did you guys divide your work? Team: "There were three broad issues in the moot. We split it three ways, and worked on them separately. We met frequently to discuss with each other while preparing for the moot." Team: We could not have done this moot without the support extended by our college, particularly the Vice Chancellor and UGC Chairperson. The concessions granted to us were crucial to our performance. Team: Each of us have participated in different moot court competitions. Last year, the three of us did the Vis Vienna and East moots together. Team: We haven’t decided yet. We prefer to maintain a broad range of practice areas. Team: Time management is very important for mooting. We’ve learnt to maintain a good balance between academics, internships, and co-curricular activities like mooting. The moot is well-spaced out and after memo qualification; we had close to two months to prepare for the orals. This was really convenient, and we were able to intern and prepare for the moot side by side. LiveLaw: What would you like to do after the law school? Team: We each have different post-law school plans. One of us is joining a leading law firm. Two of us are yet to make up our minds. Team: The team we faced in the finals – Monash University – was the toughest side we faced. We had faced them in the preliminary rounds as well as in the finals. We were lucky enough to beat them both times. Team: This was not true for us. The Oxford IP Moot has a memo qualification and we worked hard for that. However, by the time we left for the oral rounds, we had made significant changes to both the content and structure of our arguments. As the moot does not weigh memo marks in deciding oral rounds, we had this flexibility. Team: Mooting is a great opportunity to expose oneself to different areas of law and is a really great learning experience. It also teaches you valuable life skills like how to work in a team, handle pressure, balance different priorities etc. Above all, it’s a fun activity and one gets to travel!